Satsuki Bonsai-en Imports, LLC - Bringing the Art of Bonsai to you. Bonsai is the century old art of miniaturizing many varieties of trees and shrubs in small shallow pots or trays for decoration in homes, gardens and offices. Originally a past time for the wealthy, the art of Bonsai has become common for all classes to enjoy and pass on to their children. Conifers, Deciduous, broad leaf Evergreens, Tropical and many other varieties of trees and shrubs are cultivated in the art of Bonsai. One of the most unique is the Azalea with their many colors and flower shapes. The Azaleas bloom one month a year and are outstanding. Satsuki Bonsai-en Imports aspiration is to propagate the care and culture of Azaleas for quality Bonsai enjoyment. 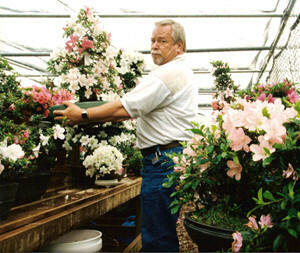 Satsuki Bonsai-en imports a variety of Azaleas with many flower forms and colors. We are one of the authorized quarantine facilities in the USA and can provide services for people that travel to Japan and wish to purchase legally importable varieties of trees (not just Azaleas) for Bonsai. Satsuki Bonsai-en Imports also offers a wide variety of resources such as books, lectures, demos and workshops. These resources will help you with the care and cultivation of your bonsai. Also, we offer many products for your Bonsai needs - Japanese soils, containers, screens, Yamagoke moss, display tables , Shoji screens, wire, tools and other specialty items. For the true Bonsai adventurist there are three Satsuki shows held in the last week of May and first week of June, these are the final and largest shows of the year, starting in Tokyo in Ueno Park, Utsunomiya and Kanuma City. Group and private tours are offered through Satsuki Bonsai-en, Imports. For more information please visit our tours page. Satsuki Bonsai-en Imports, LLC brings the art of Bonsai to you.